At Value Care we take the difficulty out of finding qualified and compassionate caregivers for our clients with disabilities. We know every individual has different levels of care needs, which is why we take the time to consult with each of our clients to find out what works best for them. Caregivers provide help when and where our clients need it. 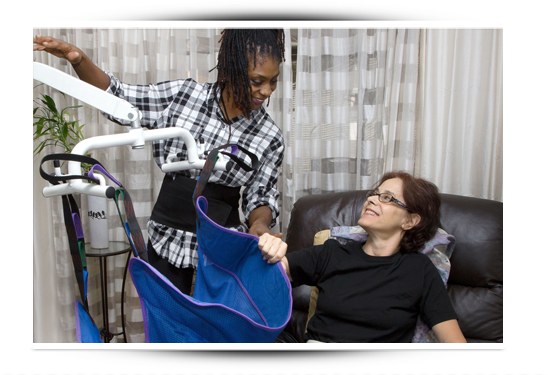 Whether our clients are at home, in an independent living facility, hospital, or elsewhere, the caregivers and companions we refer will come to them. We verify the qualifications of care professionals with our FIVE STAR PROMISE. At Value Care we genuinely care about our clients and want to match them with the best possible caregivers in Florida. Contact Us and find out how we can help you and why we guarantee our ability to match companions and clients with our First Day Satisfaction GUARANTEE. Through our Care Match Program, one of our Customer Relations Professionals consults with each client to determine what their care needs are. For clients with disabilities, it may be as simple as some help around the house a few times a week, or they may need around the clock care. Whatever our clients’ needs are, we will work to refer a caregiver willing to meet and exceed them. Because you can easily arrange flexible scheduling and no minimum amount of visits, we can offer our clients the most affordable costs for disability care. On average our clients save 25% or more off average industry prices. Pay Less, Get More Care! We go the extra mile to refer caregivers that are better qualified to provide hands on support. We genuinely care about the well being of our clients and want to make certain they are in good hands. Call Us Today if someone you love has a disability and needs some extra care.